가... 준석 씨, 뭘 그렇게 열심히 봐요? 나... 아침에 일찍 나오느라고 신문을 못 봤어요. 가... 요즘 뉴스라고는 골치 아픈 것뿐이라서 저는 신문을 볼 때 텔레비전 프로그램이나 공연 안내가 실린 면만 봐요. 나... 그렇지 않아도 저도 볼 만한 공연이 없는지 알아보려던 참이었는데......미치코 씨, 이 야외 공연이 재미있을 것 같은 데요. 가... 유명한 가수들이 많이 나오네요. 재미있겠는데요. 가... 그런데 오후에 비가 올 것 같지 않아요? 비가 오면 야외 공연은 취소될지도 몰라요. 나... 잠깐만요. 아, 여기 일기 예보가 있네요. 남부 지방에는 오후에 비가 오는데 서울. 경기 지역은 구름만 많이 낀대요. 비가 올 확률이 높지 않아서 괜찮겠는데요..
가... 그럼 공연장 매표소 앞에서 조금 일찍 만나요. 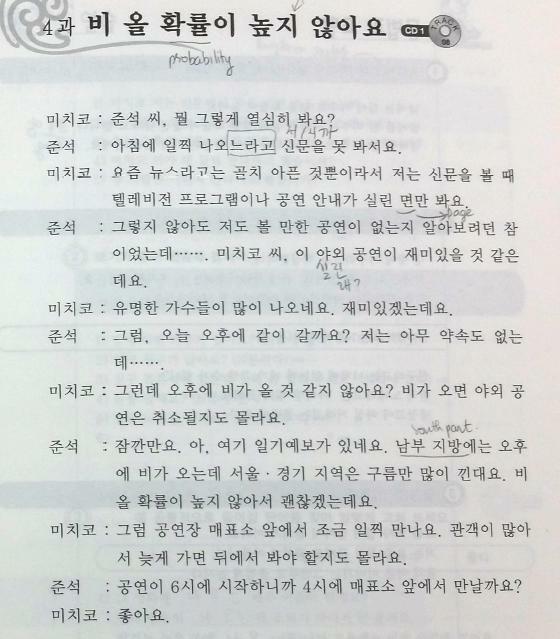 관객이 많아서 늦게 가면 뒤에서 봐야 할지도 몰라요. 나... 공연이 6시에 시작하니까 4시에 매표소 앞에서 만날까요? 낮에는 집에 아무도 없을 확률이 높아요. There is high chance that no one is at home during the day (time). 담배를 안 피우는 사람은 암에 걸릴 확률이 훨씬 낮다고 합니다. It is said that people who do not smoke will have very low chance of canner. 연락을 안 해 놓으면 사장님을 만날 수 있는 확률은 거의 없을 거에요. If you don’t contact in advance, there is almost no chance that you can meet the president. 지금은 나갈 수 없어요. 집에 사람이라고는 저 혼자뿐이거든요. 먹을 거라고는 라면뿐이니 라면이라도 먹어야지요. Because instant noodle is the only edible food, I have to eat instant noodle. 친구라고는 너밖에 없는데 네가 그럴 수가 있니? I don’t have any friend except you, but can you do that? I can’t sing any Korean song except 아리랑 song. 냉장고에 마실 거라고는 물밖에 없다. There isn’t anything drinkable in the fridge except water. 요즘 회사 일이 많아서 골치가 아파요. These days there is so much work at office, so I am really annoyed. 저는 요즘 취직 문제로 골치가 아픕니다. I am annoyed by the job search these days. 골치 아픈 이야기는 그만두고 즐겁게 놉시다. Stop the annoying talk and let’s enjoy. 어제는 맑더니 오늘은 구름이 많이 끼었네요. Yesterday it was clear, and then today it became very cloudy. 안개가 많이 낀 날은 특히 운전할 때 조심해야 해요. When you drive, especially, in foggy day, you must be careful. 테이프에 먼지가 많이 끼어서 소리가 잘 안 나와요. Dust covers much (densely) on the radio tape, so the sound is not good. Unit 04 Probability of rain is not high. A… Chunseok, what are you staring at? B… In the morning, because I went out earlier, I couldn’t read newpapers. A… The thing that I got annoyed these days is only the news, when I read newspapers, I only saw the section reported about the performance information on TV program. B… Although it is not like that, I also realize that there is nothing worth to see excepting for the performance. Michiko, this outdoor performance seems to be interesting. A… Many famous singers will come. It will be interesting. A… By the way, Isn’t it going to rain this afternoon. If it rains, the outdoor performance might be canceled. B… Wait a minute. Here is the weather forecast. In the southern part, it rains in today afternoon, but Seoul and Gyeonggi, it becomes very cloudy. Probability of raining won’t be high. A… Right, we will meet a little early in front of the performance ticket office. There are many audience, so if we come late we may have to see behind. B… Since the performance starts at 6 o’clock, shall we meet in front of the ticket office at 4 o’clock?